Or, get it for 45200 Kobo Super Points! This is the first book to comprehensively address neurodiagnostic testing for the broad scope of clinical neurophysiologic disorders in the pediatric population. The field of clinical neurophysiology has expanded exponentially with the development of new approaches, techniques, studies, and certifications. This book bridges the gap in clinical information available for practitioners who use neurophysiologic techniques to evaluate and treat children and adolescents with epilepsy, sleep, neuromuscular, and autonomic disorders but may not have subspecialty training in each individual field. 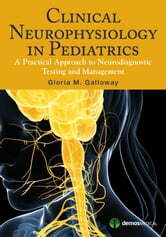 Drawing on the expertise and clinical wisdom of leading practitioners and researchers in each area of clinical neurophysiology, the book focuses on the technical and interpretive skills unique to treating the pediatric population. It covers the full spectrum of neurophysiologic topics including pediatric sleep disorders, epilepsy, febrile seizures and nonepileptic paraxosysmal disorders. Chapters address pediatric muscular dystrophies, EMG, brachial plexopathies, peripheral neuropathy, intraoperative monitoring, evoked potentials, evaluation of autonomic disorders, and EMG studies for all applications. This singular working reference will be indispensable for the clinical provider as well as for trainees and technologists who use a wide diversity of clinical neurophysiologic skills to more accurately diagnose and treat neurologic disorders in children and adolescents.